When we speak about going green, it is without a doubt that it is not easy to find products that runs on solar energy alone. 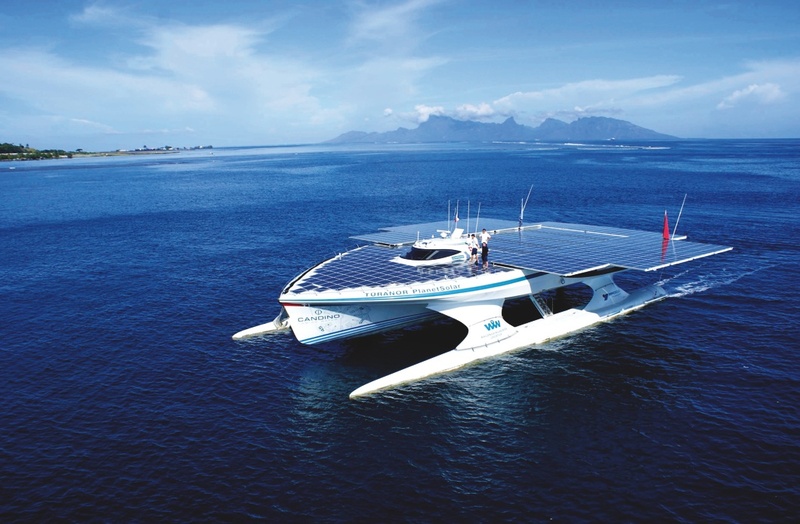 However, one such astonishing green creation that runs with solar power technology is the Tûranor PlanetSolar – the only boat on earth that is entirely powered by solar energy. Asia Tatler goes onboard to see the beauty when it came to Hong Kong for a short stay last month. Docking at the Ocean Terminal, the Tûranor PlanetSolar is 31 metre long and 15 metre on the beam. With a flat top entirely covered with solar panels, it is a classic example of form-follows-function. 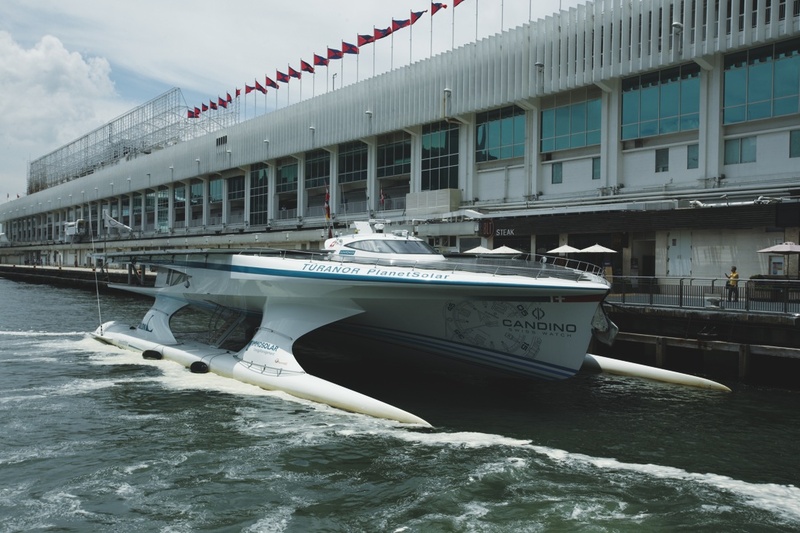 A flat top to provide maximum area for the array of solar cells; carbon fibre construction to keep weight to a minimum without compromising strength; an 11- ton array of lithium ion batteries; ultra-slippery wave piercing catamaran hulls to allow the boat to move through the water with a minimum of resistance, and super-efficient electric motors driving half-submerged 2 metre propellors to push it all along. Captain Erwann Le Rouzic explains that it is the totality of the design that is revolutionary, not any one of the individual parts. ‘Tûranor’ is a name from Lord of the Rings, meaning ‘power of the sun’. The boat was built in Kiel, Germany, and launched in March 2010. The world-girdling expedition set out from Monaco in September last year and has so far crossed the Atlantic and Pacific Oceans, and passed through the Panama Canal. For one fairly obvious reason – following the maximum amount of available sunshine. Tûranor’s route around the globe stays as close as possible to the Equator, between the Tropics, with the exception of a detour south to Australia. 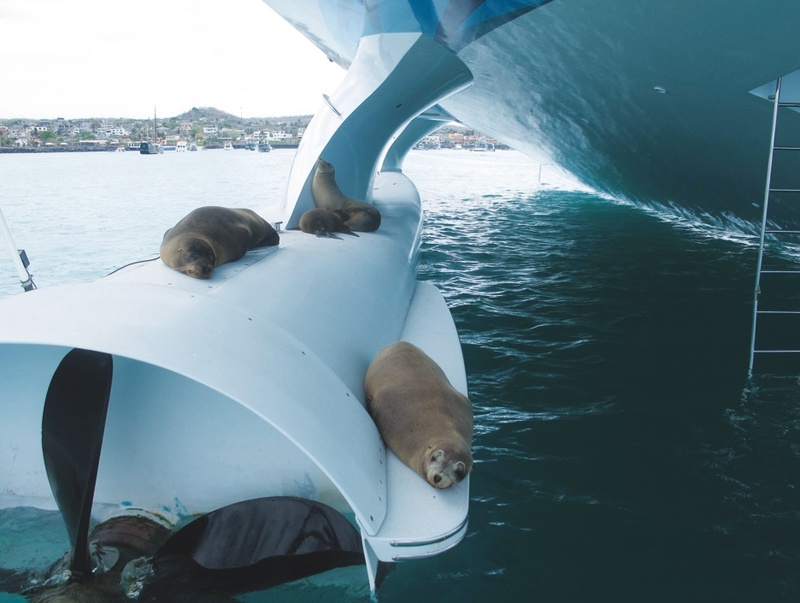 Passage planning for a solar powered vessel has to take into account the ocean currents, waves and winds, but with sunlight and the storage-capacity of the world’s biggest lithium ion battery built into the equation as well. Looking for boat charters? Here are some of the best ones in Hong Kong. 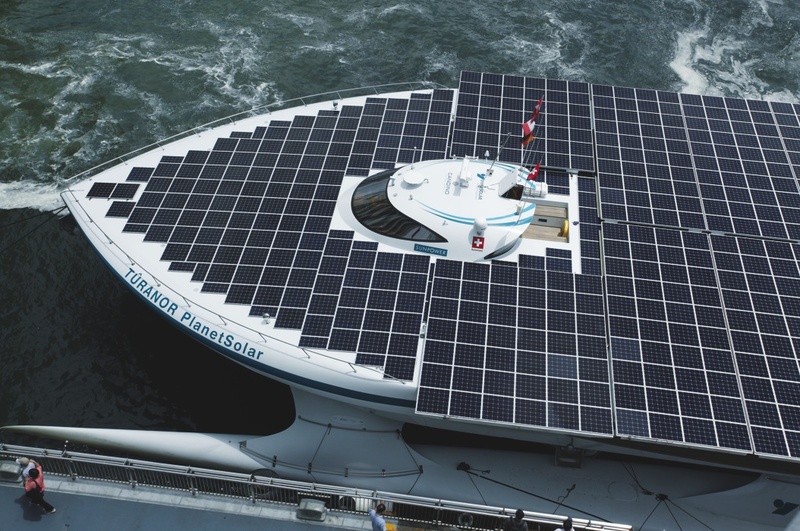 The solar panels measuring 537 square metre are capable of generating 93.5 kW of electricity, enough to drive the two main 10hp motors that push Tûranor along at 4kts – top speed is 8.5kts, but that’s not energy-efficient – with some left over to charge batteries for operating in the hours of darkness and when the sun is obscured by clouds. Auxiliary 50hp motors assist with close-quarters manoeuvring. The ship can run for three days on fully-charged batteries, and a hot blue-sky Hong Kong summer’s day will fill them up again in two days. Absolutely,everything is running on that one power source – the navigation systems, the lighting, the on-board computers and the fans (there is no air-conditioning). It might cost very little to run – after all, sunshine is free, and nobody has succeeded in slapping a tax on it yet – but you can’t build a boat like Tûranor and run a global-sized project for nothing. Project financier Immo Stroher has been pursuing the possibilities of solar power generation for a long time and believes that his US$18 million investment in the Tûranor will help drive forward the development of sustainable energy technologies on the water and in other mobile applications. The aim is to offer future-proof solutions for sustainable living in major cities and environmentally responsible mobility concepts. 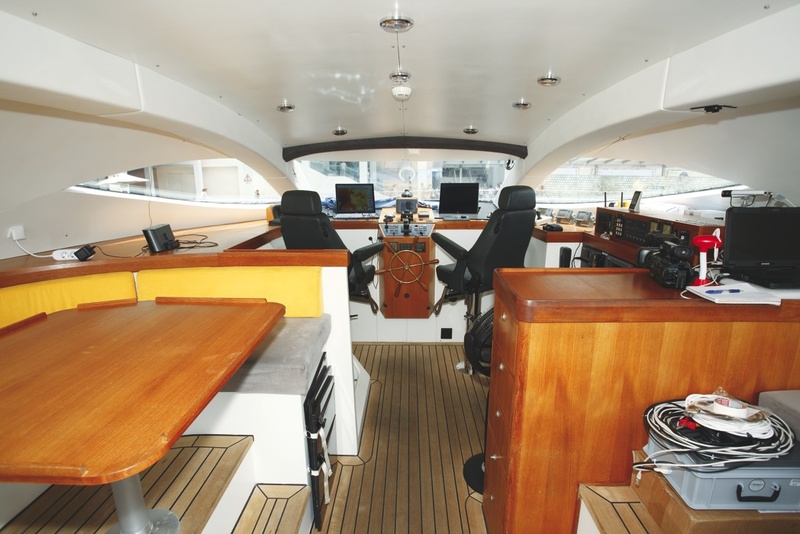 From speedboats to superyachts, see the highlights of the Monaco Yacht Show 2011 here. Tûranor’s first port of call after crossing the Atlantic last year was Cancun, Mexico, and a guest appearance at the UNFCCC (United Nations Framework Convention on Climate Change)provided visible proof of efficient and forward-looking use of solar technology to improve the climate of the planet. By now, the silent solar ‘sailor’ has already headed off on the next stage of her journey, via Singapore to the Red Sea and back to the Mediterranean. It wasn’t a noisy departure – it’s not that sort of a project. Tûranor PlanetSolar, with her silent electric motors, is quiet. Very quiet.. But it is very probable that this is a project that will be heard, loud and clear, all over our energy-hungry and frighteningly polluted planet.